Leaving the chaos of Delhi behind me I picked up my three day tour bound for Agra and Jaipur, my mission was to sit on the same bench at the Taj Mahal that Princess Diana did during her visit. The first day was a mission but well worth all the things that I saw, very much so indeed! 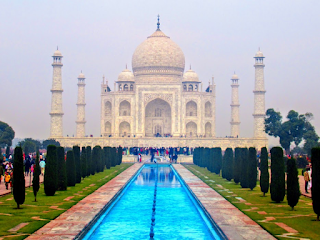 Agra had two jewels in its crown, but the rest was a definitely an eye-opening experience. The drive from Delhi to Agra took about three or so hours, exiting the Yamuna Expressway meant the Taj Mahal grew nearer. After leaving the mayhem that was Delhi, the rolling fields gave me a different view before the unassuming Taj City of Agra. 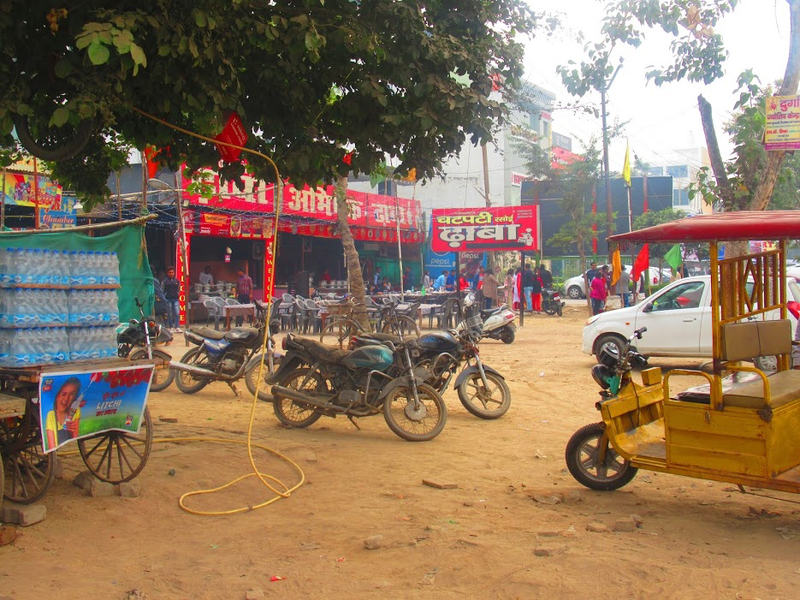 Seeing the road-side restaurant with their Hindi writing and colourful setups gave me even more of a curiousity to try more not-for-tourist foods. Picking up the guide, it was then only a short drive before reaching India's palatial icon. Tourists were out in their droves, with my one statement photo in mind I kept my cool, something told me the entry fee foreigners would be sky-high compared to the local price, that situation just isn't far! Nevertheless, I was merely steps away from one of the India's most famed pieces of Muslim architecture. Beware of the photographers, they get you working that pose in-front of the Taj, their motives were a no! Agra, don't play games! Being up-close and personal with the Taj Mahal's ivory white style made me fall in love with the love story behind its very existence. Crafted by the Mughal Emperor, Shah Janan to lay his beloved wife's body to rest. Mumtaz Mahal's death dealt such an impact on Shah's life, he felt his wife needed somewhere to rest that was just as beautiful as she was. Some shady business went down during a devastating looting, precious metals and jewels were stolen from the Taj Mahal's structure. I later learned that one of the visiting British Viceroy's of India felt so conflicted by the disrepair that the mausoleum stood in, he commanded a mass restoration project to commence that would restore the Taj to its former glory. Even though the immediate area surrounding the Mahal was crazy, I took in the beauty of Mumtaz's place with all of my attention. I was very impressed by what I saw from my visit to the Taj Mahal during that December mid-morning visit. Lady Di, I found your bench! 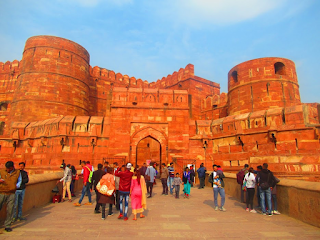 I had heard about Delhi's Red Fort and those facts didn't impress me all that much, but as it stood I was very interested to see Agra Fort after my visit to the Taj Mahal. Intrinsically linked with the Taj, Agra's own fort was a stronghold for the Mughal rulers before the British relocated the capital to Delhi, the fort acted as the main headquarters for Shah Janan and his family. It was great to walk through the many compartments within the fort to be fronted by its grandeur, the marble designs gave a certain sense of luxury. It's Arabian opulence reminded me of Disney's Aladdin in the most basic sense with the references that animated film made to the main buildings. Agra Fort had so much of a back-story it was hard to keep up with the tour guides words but I remembered certain quarters were for Shah Janan's many wives, he had many children from those marriages and then some. Drama within those Agra Fort walls! Yes! Mumtaz Mahal spent a lot of her life at the fort before her death, by the sounds it she spent most of the marriage pregnant? Many shady things went down through the years of the forts Mughal presence, I adored the open courtyard with such sensational marble designs. Marble, really? Shah Janan didn't seem impressed with some of the structure or looks, modifying those imperfections he obviously was a man with style in mind. Aside from the family goings on at the fort, it was really interesting to learn about yet another reference to the Mughal Empire because I had no previous idea they ruled before the British assumed power in 1803 by means and for gains I don't really want to go into any further. My day so far had been long, the drive from Delhi had been lengthy but the sights on offer made everything feel much better. 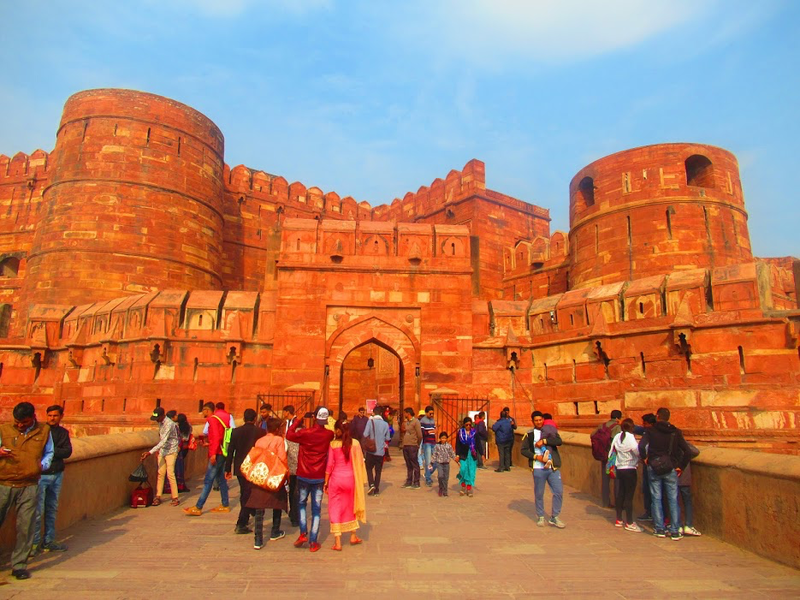 The fort surprised me, it taught me a lot about the city of Agra because things suggested that the Taj Mahal stood as the poster attraction for the city. With the days sightseeing over I was famished, having not had any breakfast that morning I was ready to run my mouth because the driver wanted to cop an attitude, not on my watch! 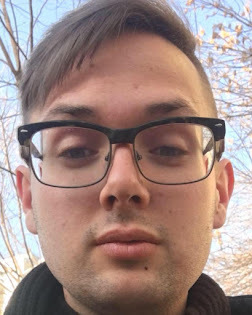 I wasn't going to any restaurants for foreign tourists with air conditioning because I wanted to save my money and it wasn't even that warm! Checking into my room for the night I crossed the road to check out a normal looking road-side restaurant that stood next to a Chaiwala. Getting some hearty curry, roti and lassi for the win I noticed a large Indian family were dining at the same place, they looked well healed so I had chosen a good place that served good for an honest price. Taking my time it was great to watch the crazy flow of traffic pass me by, forming my opinions on Agra as a city that definitely benefited from its sights but the city looked rundown, not justifying the 'UNESCO World Heritage' status of the Taj Mahal. Life! Satisfied with my lunch, I grabbed some snacks and water at the shop next to the restaurant. I noticed that a few guys were sitting inside the small road-side shop, they were sipping their chai and talking about something in Hindi, my foreign presence didn't cause a stir because they seemed interested to ask questions after I said I was from England. The chai tasted great in its own terracotta cup, I noticed the local Indian folk really had a fascination with the previous ruling British Empire for they had nothing negative to say but all positives. Being a British territory for such a long time has left a high standard of English spoken in India, for me it wasn't difficult during that tea time to communicate basic things because of the remnants of empire. Agra showed me everything that I needed it to show me, the street life impressed me as it was unexpected and wasn't negative. Returning to my hotel, I took it easy before my five hour car journey to Rajasthan's Pink City of Jaipur. Agra, done!